If you're looking for a figure that aspires to give you 1980 engineering with 2014 prices and sculpting, Yoda is it! The new The Black Series 3 3/4-inch figure has a cane, flute, coat, belt, and backpack while somehow only having 5 points of articulation at about $11. It fits in his backpack just fine, and the jacket needs some fidgeting - but is it good otherwise? Read on! And we're back! This new Luke Skywalker figure is shipping now if you ordered online somewhere like our sponsors at Entertainment Earth. It has more articulation than nearly any other Star Wars figure at this size, and has quite the accessory pool. It even looks better than some of the early promo images - but is it worth tracking down during the summer heat? Read on! Toys R Us has started to announce their Comic-Con Exclusives for San Diego! As with previous years, these will be sold at booth #2343 - Entertainment Earth. TRU will have a 2-pack "cinema scene" of 6-inch Han Solo vs. Greedo for The Black Series. They've also got classic 1990 movie Teenage Mutant Ninja Turtles, Winged Fairy Maleficent, My Little Pony Queen Chrysalis, Mighty Morphin Power Rangers Legacy Lord Zedd, and even a 50th Anniversary 3 3/4-inch G.I. Joe vehicle and figure set! Click here to see more. 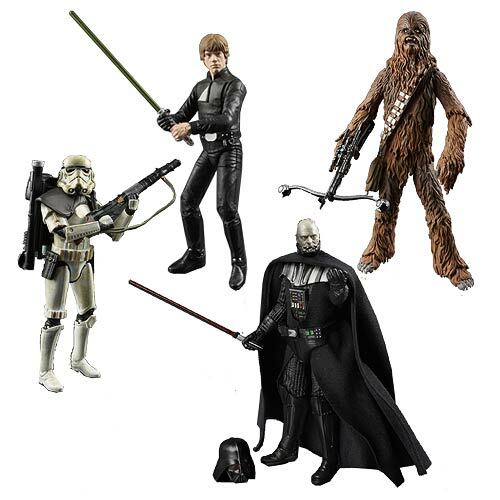 Sponsor Entertainment Earth started shipping Star Wars: The Black Series Wave 4 sets and cases this week. We'll be looking at these next week in more detail, as is the way of our people. As far as I know, major brick and mortar stores haven't put these out yet. Click here to pre-order yours for a future shipment, if you haven't already. (Order a case, get two full sets and free shipping! Order a set, and get the set.) Quick impressions after the jump. Itching for something new? Would you settle for half-new? 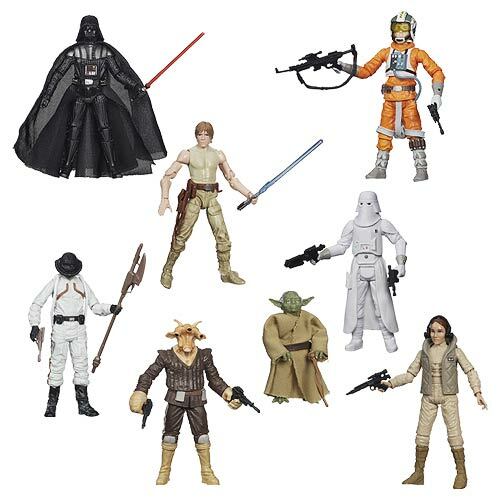 Mission Series 2-Packs Wave 3 are hitting Target stores right now - I personally eyeballed Bespin Luke Skywalker (new) vs. Darth Vader (tweaked) and Obi-Wan Kenobi (tweaked) vs. General Grievous (new!) on Sunday. You can also order them online after the jump. A giant X-wing is en route from Hasbro, and YodasNews.com shows it won't be alone. A Millennium Falcon of generous proportions - seemingly the 2008 Big Millennium Falcon minus figure compatibility and electronics - is on the way. The packaging boasts it's over 2 feet long, and Yoda's News says it may be a Walmart exclusive. Click here to see it. Ad: They're finally here! 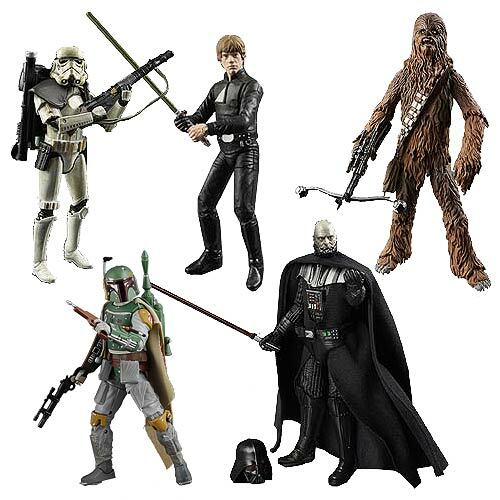 Pre-order your 6-Inch Black Series Star Wars Action Figures Wave 5 and get Free Shipping. Choose from Wave 5 or Wave 5 Revision 1 for even more fun! New characters include Jedi Knight Luke Skywalker, Darth Vader, and Chewbacca. Pre-Order yours now - click here to get them! 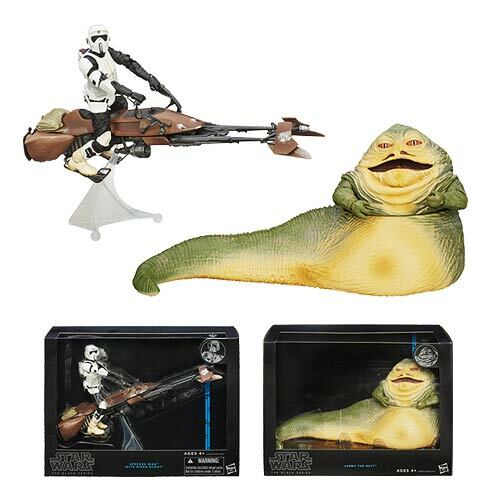 Also available - Jabba the Hutt and the Speeder Bike! Click through for pricing and availability. Rounding out the new foursome from the great white north, the Snowtrooper is one of those figures you'll be mad you can't get more of. The split "skirt" lets him sit, but the wide sculpt may make it difficult to cram him in certain vehicles - but he's perfect for filling out your AT-AT's cargo hold. From Canada, with love! This new Darth Maul is in stores now - there, not here - and is an all-new sculpt with a flared blade on the lightsaber, if you keep tabs on such things. He can fit in the Sith Infiltrator vehicle, stand, and fight. Can you ask for more? Probably, but you won't get it for the price. Read on! While my flight continues to not board me, why not read about Luke Skywalker? This new 2014 Saga Legends figure is a new sculpt in Canada right now. Is it worth the loonies? Read on! We're back! (A Dinosaur's story.) This Obi-Wan Kenobi is today's Star Wars Figure of the Day! It just hit Canada and, so far, seemingly nowhere else. This wave's absence from store shelves and online pre-sells is conspicuous so far, but thankfully a kind soul managed to help me get a set to show all of you. Hasbro officially releases photos and confirms the upcoming SDCC exclusive Black Series Jabba the Hutt Throne Room (including packaging details) and Black Series 6 inch Yoda. Check out all the visual goodness after the jump! The headline pretty much says it all - click over! Tom Kane Reveals The Black Series Yoda 6-Inch Figure.